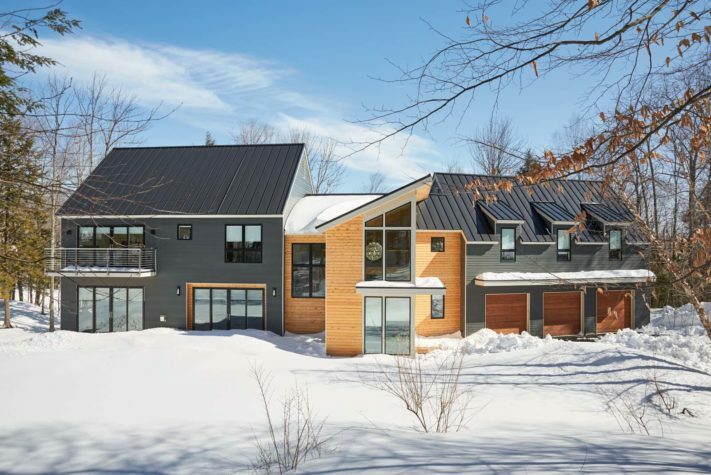 Architect Kevin Browne designed the home to fit the footprint of the lot’s previous structure but added a shed-roof entry that creates a bright welcome while adding drama to the exterior. In the sleek, symmetrical kitchen, glass back-painted in a gentle peach color picks up the warm notes of the home’s wooden features. 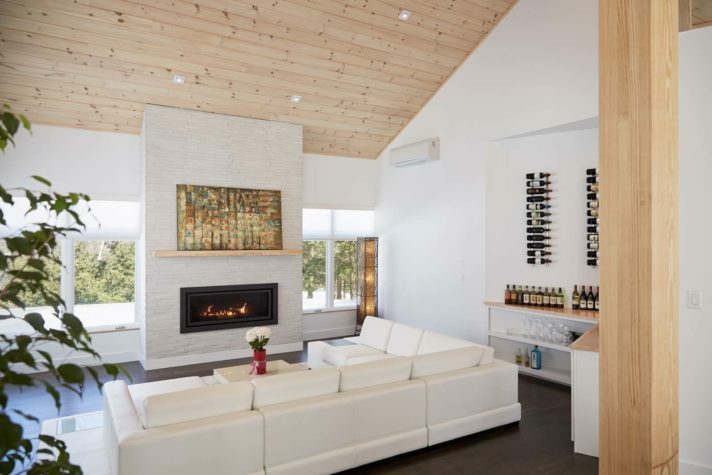 Wine racks and a collection of Japanese whiskey provide functional decor in the living area, which features one of the home’s gas fireplaces. 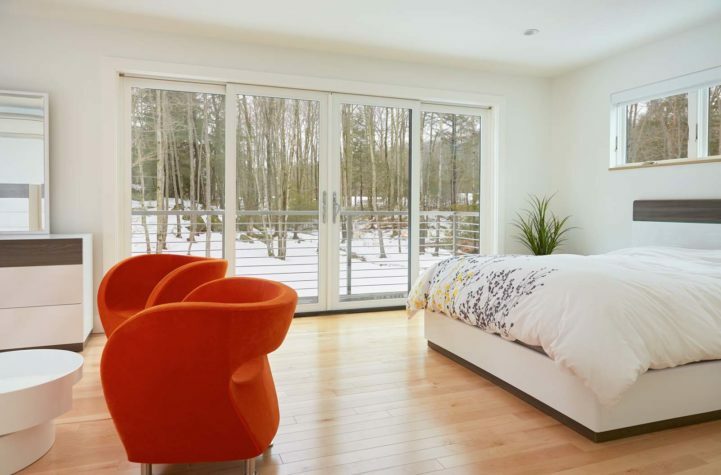 Throughout the home bright, playful furnishings enliven serene spaces, as in the owners’ bedroom and a guest wing nook. Seiji Ando came to Maine in search of a quiet place with room to grow. He’d been working in Washington, D.C., restaurants for 24 years, after emigrating from Japan in 1979. “Washington was already saturated,” he says. “And there was so much traffic.” A friend lived in the Portland area, and one summer Ando visited “to take a look at all the beautiful places.” Twenty years later, Ando and his wife, Hyon Kim, owners of the two bustling Benkay restaurants in Portland, were once again looking for a more peaceful place. They found a wooded, recessed lot in the Falmouth Country Club neighborhood that promised privacy and quiet and offered the chance to build exactly the home they wanted. The lot is beautiful, with the green of the abut- ting golf course peeking over granite ledges and between mature hardwood trees, but it took a practiced eye to see its potential at first. “When they came to it, it was just ashes,” says landscape architect Soren deNiord of Portland. The previous home had burned down, leaving just a foundation buried under rubble. Architect Kevin Browne of Falmouth consulted town records and began the design with the dimensions of the previous home in order to save the cost of blasting ledge for a new foundation. “That’s where the whole look started,” he says. “We tried to keep the forms of the house very simple, with modern, barnlike boxes.” The result is a striking combination of traditional shapes with modern styling. Calm and quiet are expressed in the home’s clean lines and bright, open spaces. 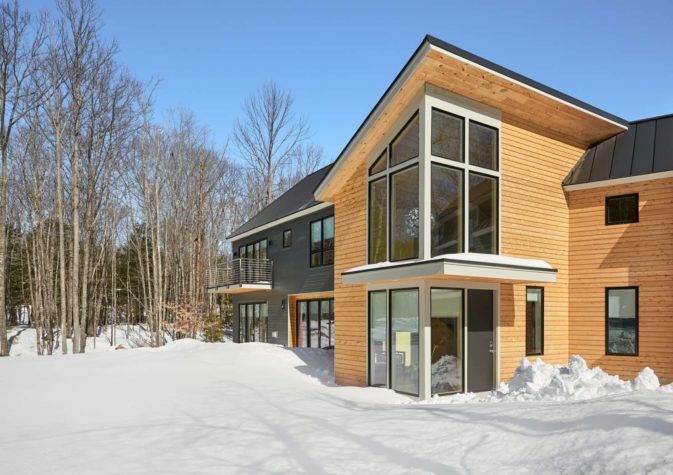 The project team, which also included Josh Sevigny of Sylvain and Sevigny Custom Builders in Falmouth, decided that revising the entry was worth expanding beyond the original footprint. “We were trying to really mark it, to make it more of a presence as you drive down,” says Browne (the home sits below the grade of the street). Their goal, says deNiord, was “to make a flow out of the arrival sequence, to create a garden feel, so it’s not just Point A to Point B.” He adds, “Every facade should be a place that you enjoy seeing and spending time in.” Situated between the home’s two dark-colored wings, the entry’s glass and cedar walls present a bright, welcoming contrast. Cathedral ceilings frame a dramatic silvery globe light, and trapezoidal windows under the shed roof add further interest. The “garden feel” is continued indoors by an assortment of potted plants that have found a sunny home near the large south-facing windows. The creamy yellow wall of the entry gives way to the home’s most spectacular feature: a floating stair- case of Douglas fir that climbs to a wooden bridge, which links the owners’ suite with the guest wing and looks down over the open-plan living area. 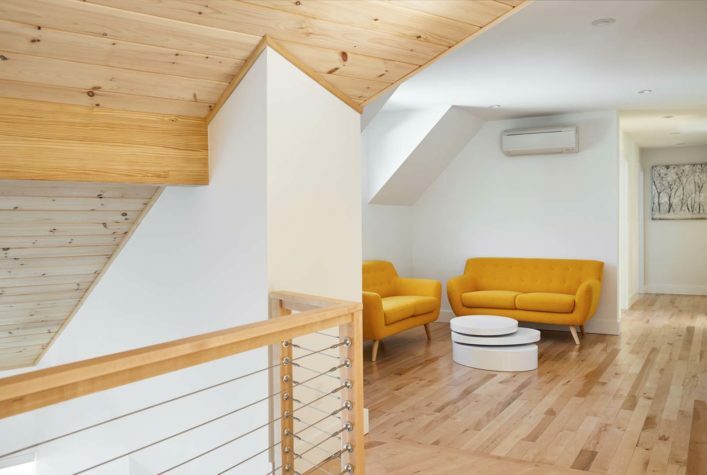 Sevigny notes that, without crown mouldings and other traditional trims to draw attention toward the walls, “The stair becomes a focal point in a lot of contemporary homes.” In this one, the large windows that surround the staircase draw intriguing angles of light and shadow on the floors and walls, while the geometric planks of honey-colored wood create a warm core for the minimalist home. The interior is painted and furnished almost entirely in white but features colorful accents in carefully selected places. Kim took charge of the interior design, aiming for a “simple and modern” style. “I kind of believe in Chinese feng shui,” she notes, explaining that the yellow wall at the entrance and the peachy one in the kitchen were chosen to encourage good fortune. Chairs and couches in vibrant shades of yellow, red, and orange bring energy and playfulness to the sleek space. Artworks were selected for their colors and look as well as their personal meaning for the owners; a niche near the bar, for instance, holds a collection of art glass from a gallery owned by a friend. “Every time I go to Japan, I buy one piece,” Ando says. Surrounding the stair on the first floor is a large, airy space that includes the dining, kitchen, and living areas. “We really need an open space, or we can’t relax,” says Ando. 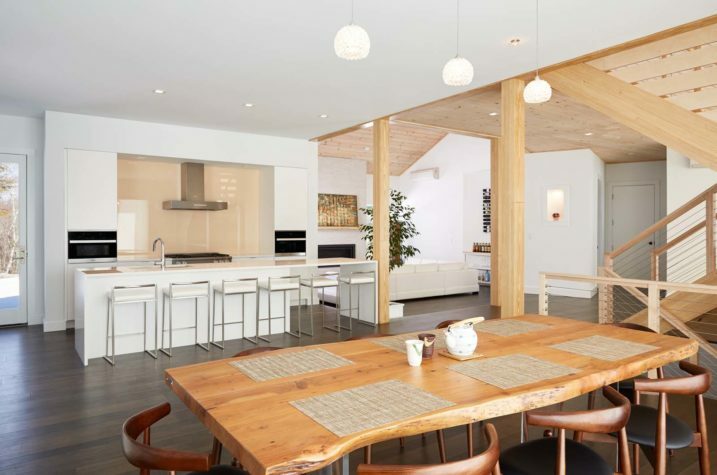 In the dining area, which is full of natural light that comes through the sliding glass doors, a table of thick live-edge wood from Corcoran Importation complements the sharper lines of the staircase. A half-wall with a gas fireplace carves out a cozy TV nook next to the dining room without interrupting the flow of light through the space. The living area is defined by a large U-shaped white sofa; on one wall an array of wine bottles draws attention to the bar, where Ando keeps a collection of Japanese whiskey and special handmade sake cups purchased on visits to Japan. Kim’s priority in the design process was the kitchen, but Ando had a different one: “I only care about the toilet,” he jokes. The owners’ bath offers a respite from Maine winters, featuring not only an automatic Toto Washlet toilet but also an elegantly tiled open shower, heated floors, and an extra-large tub that shares a double-sided gas fireplace with the owners’ bedroom. The bedroom, too, is a peaceful retreat, with a seating area, a large walk-in closet, and a balcony that looks out over the yard. DeNiord worked with the homeowners to draft a landscape design that would include a patio and pool off the dining room as well as plantings that would blend a refined, simple landscape with the woodland setting. For now, that vision exists only in the form of a rendering pinned up in the dining room. The home’s exterior, however, provides plenty of visual pleasure on its own. Sevigny covered the two main volumes in blue-gray fiber cement, which is less expensive and easier to maintain than wood siding. Arranged in an alternating pattern of horizontal planks, the dark fiber cement harmonizes with the bright cedar shiplap of the central area and the standing seams of the metal roof. Anchoring the driveway side of the house, three garage doors are large squares of mahogany arranged below three shed dormers, with a ledge in between to maintain the home’s horizontal lines. 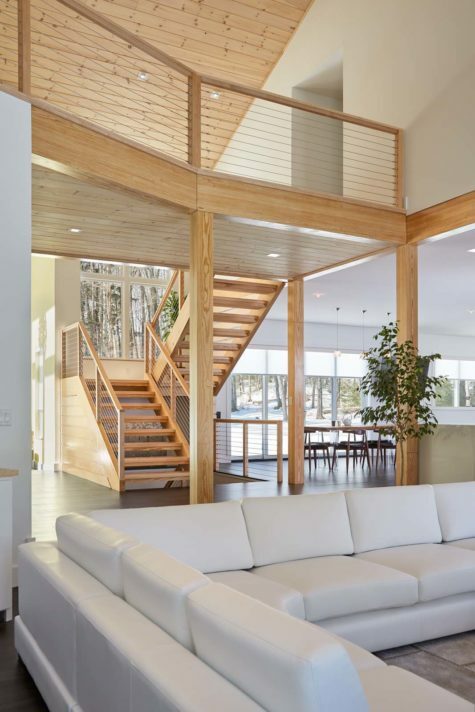 The interior’s focal point is a floating staircase of Douglas fir, leading to a bridge that overlooks the main living space. The owners’ bath features heated floors, an open shower, and a double sided fireplace shared with the bedroom. 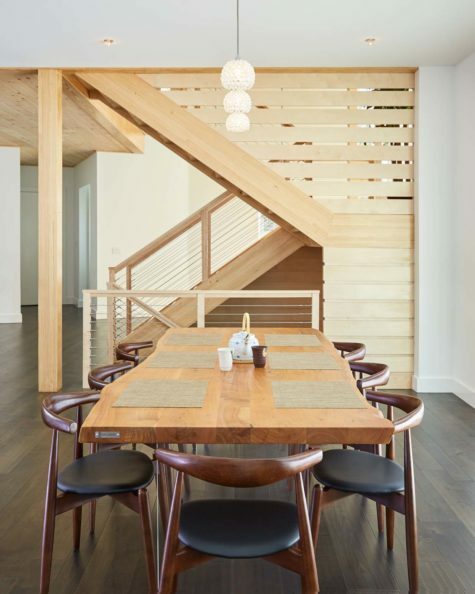 A live-edge dining table from Corcoran Importation contrasts with the geometric shape of the staircase.